First off, I don't really expect to see Trump and Kim Jong Un in the same room...anywhere. Despite talk of their upcoming meeting tentatively scheduled in May, don't bet on it. 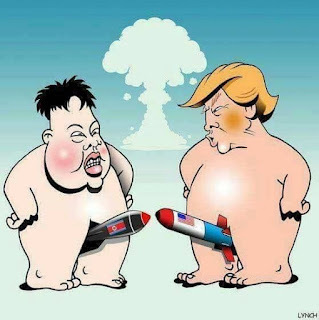 If the unthinkable happens, and the two world-class egotists do sit across from one another without calling each other a name long enough to negotiate a treaty, it would be Yuuuch! In the miracle department for sure! North Korea has the advantage in this proposed get-together. They've already called the first shot in the game by getting Trump to agree to meet. No American president has ever met with a North Korean dictator for good reason...they didn't want to legitimize the rogue regime by sitting down as equals, and without getting a major concession from them first, before any talks take place. Trump's sudden decision to meet with Kim sends a bad message to other rogue states in the world that North Korea is so powerful that the world's superpower has agreed to negotiate with them. Imagine, just for a scary moment, that Trump and Kim did sit down and got to comparing nuclear arsenals - each trying to one-up the other - as tensions rise in the room - and staffers on both sides attempt to cool them down. The final straw, I suspect, would be when they got to comparing hand sizes! They'd both bruise their chubby knuckles pushing down too hard on their respective nuclear football codes. Like I initially suggested, the odds are pretty steep that the two psychopathic leaders will ever meet face-to-face. At least, I hope not! Where Does Trump Find These People?